Ever since I posted the recipe of loh bak/five-spice pork rolls (卤肉) many people have asked me for a vegetarian version of the recipe. Talking about vegetarian loh bak, I just can’t stress enough how great they are, and how I have missed my aunt’s version. They are simply the best and one of the great dishes that she makes. I spent a huge chunk of my life (childhood until I went to college in KL) in my late grandmother’s home, with both my late grandmother and my aunt as my guardians. Every year, during the 9th month of the lunar calendar, my family in Penang celebrates “kau ong ea” or “Nine Emperor God” (九皇爷) festival. Like other festivities in Penang, this occasion calls for a big celebration where devotees follow a strict 9-day vegetarian fasting. During the festival, there are rows and rows of vegetarian food stalls sprouted all over town, serving freshly made and delicious vegetarian dishes. When I was little, I would always look forward to kau ong ea. All my family would come together and fast during the last 3 days of the festival. That was when my aunt would bring out all the “vegetarian” pots, pans, and serving ware from the storage—they are used only once a year for the preparation, cooking, and serving of the vegetarian dishes. She would buy only vegetarian ingredients, including a special MSG in a golden tin that is specific for this festival. During the 3 days, she would make many vegetarian dishes such as this vegetarian loh bak, vegetarian duck (another favorite of mine) and other goodies. All my family members would then congregate to eat the vegetarian food she prepared. I had a craving for vegetarian loh bak just a few days ago, so I called my aunt for the recipe. She told me over the phone the ingredients and the basic recipe. I made it just as soon as I got myself some yam and it was quite a success, even though it’s not quite as good as my aunt’s. I am just so happy to savor these vegetarian loh bak and I wanted to share this recipe with you. I hope you get to taste the flavors of my childhood. Vegetarian Loh Bak filled with yam (taro). Absolutely amazing flavor. Steam the yam strips for about 8-10 minutes or until they are cooked through. In a mixing bowl, mix the grated yam bean (jicama) with all the seasonings. Add the water if the mixture is too dry. Add the steamed yam strips into the mixture, be careful not to break the yam too much. Try to keep the strips intact. Lay the tofu skin on a flat surface. Soften it with some water until it's ready to wrap. Add about 2 spoons of the filling onto the center, arrange the yam strips horizontally across. Fold in the two sides and roll up tightly. Seal the edges with the sealing starch. Set aside. Heat up your wok or frying pan with enough cooking oil. Once the oil is fully heated, deep-fry the vegetarian loh bak over medium heat until golden brown. Dish out, let cool for 10-15 minutes, then cut it into pieces, serve with your favorite chili sauce. MSG is optional. I don't use MSG but I grew up eating foods with MSG. 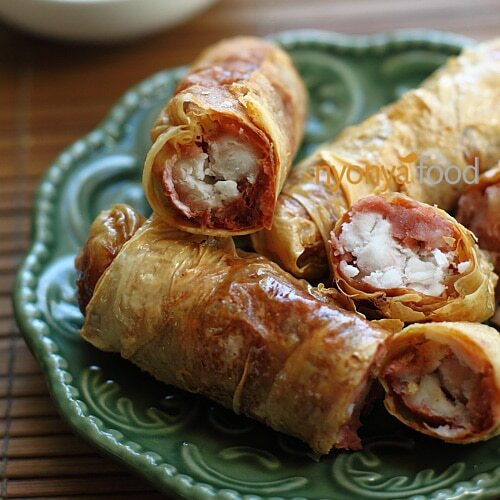 Make sure the filling is tightly rolled up to ensure a firmer texture after frying. Do not cut the rolls right after deep-frying. Let cool for 10-15 minutes before cutting into pieces as they may not cut well when they are hot. Do you have a link or picture to the tofu skin you mentioned in this post? Thanks!! Hi…when i try to click the recipe , it seem that not allow to see the content. I Wwonder why…pls advice.